Tom Gauld’s latest in The Guardian Review in response to the grossly misunderstood Marie Kondo book decluttering affair. Do I need to say you should follow Tom and buy his stuff? Most people who like their books and reading will probably have heard about an article in Forbes attacking libraries. I thought I’d present the article and a few rebuttals here, because I like libraries and books and how badly the author of the piece fared. Amazon should open their own bookstores in all local communities. They can replace local libraries and save taxpayers lots of money, while enhancing the value of their stock. There was a time local libraries offered the local community lots of services in exchange for their tax money. They would bring books, magazines, and journals to the masses through a borrowing system. Residents could borrow any book they wanted, read it, and return it for someone else to read. They also provided residents with a comfortable place they could enjoy their books. They provided people with a place they could do their research in peace with the help of friendly librarians. Libraries served as a place where residents could hold their community events, but this was a function they shared with school auditoriums. There’s no shortage of places to hold community events. Libraries slowly began to service the local community more. Libraries introduced video rentals and free internet access. The modern local library still provides these services, but they don’t have the same value they used to. The reasons why are obvious. One such reason is the rise of “third places” such as Starbucks. They provide residents with a comfortable place to read, surf the web, meet their friends and associates, and enjoy a great drink. This is why some people have started using their loyalty card at Starbucks more than they use their library card. On top of this, streaming services such as Netflix and Amazon Prime have replaced video rentals. They provide TV and movie content to the masses at an affordable rate. Actual video rental services like Blockbuster have gone completely out of business. Then there’s the rise of digital technology. Technology has turned physical books into collector’s items, effectively eliminating the need for library borrowing services. Of course, there’s Amazon Books to consider. Amazon have created their own online library that has made it easy for the masses to access both physical and digital copies of books. Amazon Books is a chain of bookstores that does what Amazon originally intended to do; replace the local bookstore. It improves on the bookstore model by adding online searches and coffee shops. Amazon Go basically combines a library with a Starbucks. At the core, Amazon has provided something better than a local library without the tax fees. This is why Amazon should replace local libraries. The move would save taxpayers money and enhance the stockholder value of Amazon all in one fell swoop. As you can see, this article was terrible. The arguments are the sort you hear from the “let’s privatise everything” and the “what do you mean you won’t pay for the privilege of working in my asbestos mine?” crowd. They don’t believe in public goods, public benefits, nor that poor people are people. Needless to say, the author of the piece proceeded to be mocked and ridiculed. I hope he didn’t go to a public hospital for treatment of that burn. To spell it out, Panos’ argument forgets that Amazon is a company whose goal isn’t to provide books to people, instead their goal is to make money. A library, however, is there to provide a community benefit of knowledge, education, and entertainment. Libraries are a key tool in creating a literate populous who are better able to contribute to our society. Plus, they have books. Books are awesome. Anywhere with books is awesome. Panos, of course, couldn’t admit he might have made a mistake. Seriously, EveryLibrary keeps going in showing how bad his research is. I have no idea how he became a professor. There are, of course, many problems with this idea. First of all, libraries cost the average American taxpayer over 18 years old just $4.50 per month. An Amazon Prime subscription alone is nearly double that price and you get very little for free with that subscription because you still have to buy books or pay more to gain access to premium goods or services. Source. Amazingly enough, Panos was correct in claiming that our taxes pay for libraries… This is the sort of insight I think only a Professor of Economics could give us. But he has rather overstated the cost of libraries (unless he has 10x the average property portfolio) and failed to understand how much buying books costs. The USA does things a little differently to what we do here in Australia. The USA ties library funding to levies and property taxes, so richer areas get nicer better-resourced libraries, whilst poorer areas get about what they always do. In Australia, our libraries are funded out of the state government budget. Do us Aussies get good value for money just throwing our regular tax dollars at libraries? Let’s look at the Western Australian State Library, which has a 2016-17 budget of $9.8 million, or $3.38 per person. Now, even if we account for only the third of people (2009-2010 ABS data) who go to libraries as paying for them, then it is $9.95 per person. In Australia that wouldn’t even buy one discounted paperback. And this doesn’t even account for all of the other things libraries do with that budget, like the reading programs, book launches, archiving, history preservation, and maintaining that fleet of Ferraris they drive to work. Seems like a good investment to me. Fortunately, Forbes pulled the article, despite its popularity, because of the backlash. They realised, far too late, that Panos didn’t have a clue and his arguments were rubbish. Interestingly, that hasn’t stopped them from publishing climate change denial articles. At least we love libraries, if not the planet we live on. I guess I am both happy and sad. I am happy because apparently young people in Riverside, California will never witness or experience mortality since they won’t be reading my book, which is great for them. There are all sorts of weird reasons that books have been banned in the past and present. Last year I covered the topic at length with both the reasons and the recent favourites for the book banning trolls. As another year rolls round, nothing has really changed. Please, won’t somebody think of the children!! The big take home from this infographic is that readers are more interested in reading, not on the format it comes in. I also found it interesting that people read slower on an e-reader (which I’d guess is because the screen is smaller and requires more ‘page turns’ which breaks reading flow) yet those using e-readers read an average of 9 more books per year (24 vs 15). In summary: reading is good, go and enjoy a good book. It seems that the Huffington Post are stealing my article ideas. Only three days after my article lamenting censorship of books, they do an article on the 2013 Banned Books campaign (September 22-28th). Now I’m not bitter, in fact, I’m currently covered in orange sherbet. So this follow-up article is to add my support to the Banned Books Campaign and talk about the most frequently challenged books of last year. 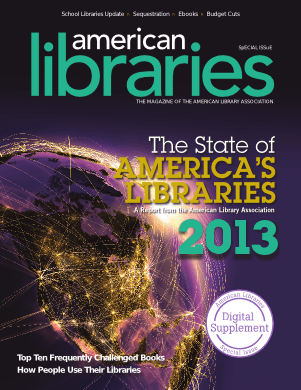 The annual report of the American Library Association had a lot of interesting findings. They are still having problems with publishers allowing them to loan ebooks (sigh – I bet the same arguments were made when libraries first started lending books), the people using libraries still think that they offer a very important service, they have become technology and research hubs for people, but visit rates have dropped a bit. The really interesting thing for me – because I’m not American, let alone a member of an American library, so all of those points are belly lint to me – was the top ten list of challenged books for 2012. ■ Captain Underpants (series), by Dav Pilkey (offensive language, unsuited for age group) TA: Exactly what were parents expecting from a book with this title? ■ The Absolutely True Diary of a Part-Time Indian, by Sherman Alexie (offensive language, racism, sexually explicit, unsuited for age group) TA: Oh noes, a young adult book that doesn’t treat the readers like kids!! ■ Thirteen Reasons Why, by Jay Asher (drugs/alcohol/smoking, sexually explicit, suicide, unsuited for age group) TA: Another young adult book that deals with real issues, can’t have that! ■ Fifty Shades of Grey, by E. L. James (offensive language, sexually explicit) TA: An erotica book that is sexually explicit….. Words to describe the stupid, fail me. ■ And Tango Makes Three, by Justin Richardson and Peter Parnell (homosexuality, unsuited for age group) TA: Based on real penguins, must be evil!! ■ The Kite Runner, by Khaled Hosseini (homosexuality, offensive language, religious viewpoint, sexually explicit) TA: Be warned, the characters aren’t white or Christian!! ■ Looking for Alaska, by John Green (offensive language, sexually explicit, unsuited for age group) TA: Written by John Green, so clearly the complainants were too stupid to enjoy the book. ■ Scary Stories(series), by Alvin Schwartz (unsuited for age group, violence) TA: The title clearly didn’t give the game away for some sensitive little souls. ■ The Glass Castle, by Jeannette Walls (offensive language, sexually explicit) TA: Real life is clearly too confronting for some readers. ■ Beloved, by Toni Morrison (sexually explicit, religious viewpoint, violence) TA: Someone clearly thinks that slavery is a lot more fun than the author portrayed it. The thing I find striking about this top ten list is that the books are all multiple award winners (except that crud by EL James, which makes up for lack of awards with sales to keep a publishing house afloat). As such, I’d hazard a guess that most of the complaints are coming from people who haven’t read the book, nor let their little darlings near a book. We can only hope that next year people are too busy reading good books to complain about them.